Jack Bell Building for the School of Social Work is located near the red arrow on the map below. You can plot a second location below. 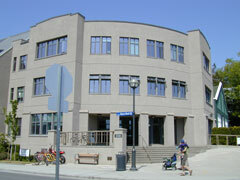 Finding Your Way: The Jack Bell Building is located at the intersection of West Mall and University Boulevard across from the Ponderosa Centre. Detailed Directions: A road map and detailed directions for Jack Bell Building for the School of Social Work can be found on Google. Use the search function below to find and highlight a second location with an orange arrow on the map above (the red arrow will indicate the first location, Jack Bell Building for the School of Social Work).